Sunday 24th of March saw the HoundDogs U16's travel to the Home of Kent Phoenix to join in a joint scrimmage against East Kent Mavericks. Coach Boorer added "the session worked well for the players from all three teams. Lots of skills were developed with game situation play. 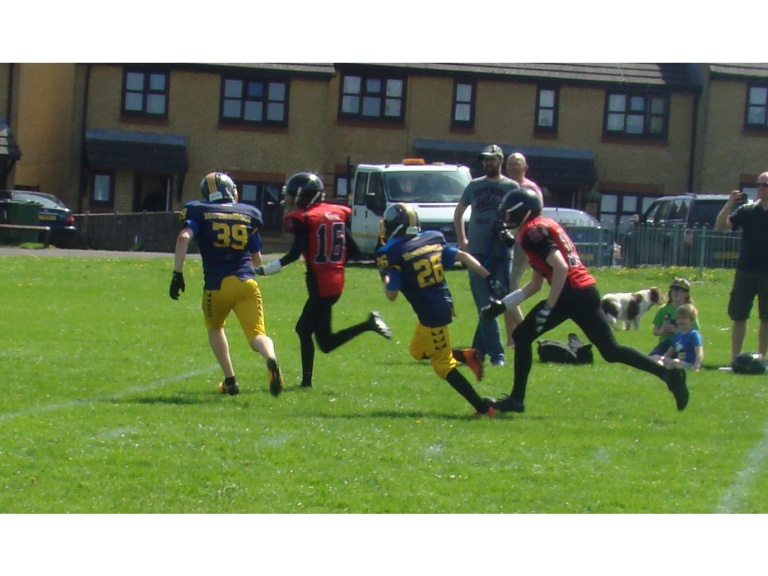 We saw players from the two teams combine to take on the Mavs, who have been competing in the BAFA leagues for the last few years. They have a lot of players with a lot of experience, where as we the total opposite. However, we were no way out played. The HoundDogs players were only given the play book on Wednesday night and the Phoenix played hadn't even seen it, but they all took the instruction extremely well, and the coaches from both teams should be very pleased with their players. We had a new QB who only just taken to the position. Liam completed his 1st ever TD and did very little wrong all game. Alex played well at Centre however, we have some work to do on his snapping and Harrison and Ned led the Defence very well some some greta open field tackling." Defence MVP - Seb Portales. Work hard all game trying to disrupt the QB, playing against a player twice his size. Seb finished the game with a sack and put the QB under pressure several times.